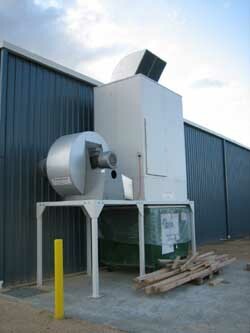 Australian Dust Control has expanded their range of heavy-duty shaker dust collectors. These dust collectors have a shaker mechanism to clean the filter socks during the shutdown intervals of the dust collector. This style of dust collector is suitable for many industries including, timber, paper, plastics, powder coating & metalwork and is used extensively in the Powder and Bulk Materials Handling Industry. Shaker dust collectors are a very economical alternative for dust control. 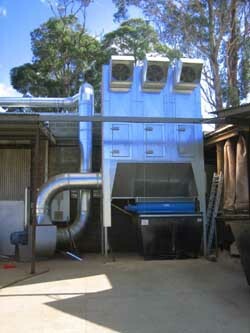 Australian Dust Control supplies this type of dust collector for smaller systems for example in schools & TAFE colleges, with much larger systems supplied to industry. The range of shaker dust collectors is now available with airflow capacity up to 50,000m3/hr. Australian Dust Control have also recently introduced a new range of reverse flow dust collectors, called the “chain Filter”. This new dust collector is truly a modular system, allowing for future expansion. This is achieved by adding additional filter sections to the original dust collector, whilst maintaining the existing waste discharge point. 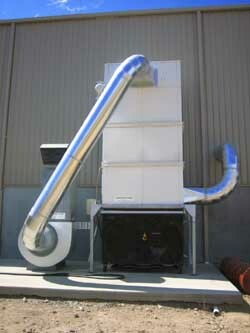 This allows the company to provide its customers with a "future proof" dust collection system. The company also continues to supply an expanding range of reverse pulse dust collectors to a wide variety of industries and provides a full turnkey service including design, manufacture and installation of equipment, as well as providing an ongoing maintenance program for the dust collector system. Reverse pulse dust collectors are available with capacities up to 100,000m3/hr airflow.